Many people are fascinated by railroads. At one time, railroads were connected to most aspects of community and economic life, and almost everyone had the experience of taking the train to some distant destination. Today, railroads are still a vital part of the nation's commerce, but they have largely evolved into less publicly visible movers of freight. For the most part, the romance and glory of the great age of railroads has passed from the scene. One way of remembering this bygone era is through collecting artifacts that have survived the years. Most railroad lines were (and are) large enterprises requiring vast amounts of material and equipment to operate. While much of this material and equipment like locomotives, cars, buildings, etc. are "collectible" for only a small number of people and organizations with the resources to maintain them, smaller items like lanterns, china, paper, and locks are well within the reach of individual collectors. Therefore, many people seek out such items -- often called "railroadiana" -- at auctions, garage sales, antique shows and "collector events". There is no standardized set of categories for railroadiana. In fact, the items associated with railroads are vast and almost defy classification. However, here are some of the more popular types of items that railroadiana collectors have in their collections. To make their dining cars service an enjoyable experience, railroads gave a lot of attention to the china that was used. Often custom patterns were employed with the railroad's name or logo incorporated into the design or at least marked somewhere on the piece. Nowadays collectors prize this china, and it has become one of the most popular categories of railroad collectibles. Within any given pattern of railroad china, a variety of different types of pieces may have been produced. These include plates, saucers, coffee cups, demitasse cups, compotes, teapots, chocolate pots, butter pats, egg cups, bouillon cups, ashtrays, and others. In order to use the wide variety of locks that railroads used to secure switches, signals, buildings, and other facilities, employees were issued special keys. Railroad keys were typically made of brass. As with locks, there are different styles of keys, but the majority of railroad keys were of a standard size with the bit customized to fit the particular locks of each railroad. Today, keys from long-gone railroads are much prized by collectors, with rare ones having substantial value. Railroad lamps were generally intended to be stationary, were generally made of a sheet metal or cast metal body, and used lenses to amplify light from an interior light source. A wide variety of different lamps were used by the railroads, including semaphore lamps, classification lamps, train order lamps, bridge lamps, marker lamps, and switch lamps. For railroad crews of yesterday, lanterns were an essential tool of the trade for relaying signals and inspecting trains at night. While modern electric lanterns are still used in railroad service, most collectors look for earlier lanterns that burned kerosene, signal oil, or other types of fuel. Most of these lanterns are "trainmen's lanterns", meaning that they were used by railroad crew members. There are also "conductors' lanterns" (sometimes called "presentation lanterns") which were used by conductors in passenger service and "inspectors' lanterns" which were used for inspecting trains in terminals and yards. Among collectors, any lantern or globe that carries a railroad marking is especially valued; the rarer the marking the higher the value. Locks have always been an important part of rairload operations for obvious safety and security reasons. Some collectors specialize in collecting railroad locks, particularly ones that carry a railroad marking. Early locks were often made of brass to resist corrosion and had ornate, sometimes even beautiful, castings of railroad names to identify ownership. These are sometimes called "castbacks" or "fancy back locks." Later on, railroads switched to locks of plainer design, usually made of steel. These are less sought after than the earlier brass examples but are still of interest to collectors. An immense amount of paper of various kinds was (and is) used by the railroads. Some examples: public timetables to inform passengers about train schedules, maps to advertise routes and attract freight business, employee timetables to inform crews about rules and operations, brochures to entice the public to tourist destinations served by a particular line, passes to allow guests and dignitaries free travel on trains, and many other types of paper. For paper items that were produced for the public, railroad companies gave a lot of attention to attractiveness and design. Today, many collectors seek out this paper, some specializing in particular types such as timetables or passes. From the very beginning of the industry, railroads occasionally needed to provide free transportation to individuals. For example, officials of other roads were sometimes given a tour of the lines, prospective shippers were invited to examine facilities before agreeing to contracts; employees needed to be transported to a work site, and so forth. The mechanism for regulating such free transportation was the pass. Typically a pass took the form of a small piece of cardstock, about the size of a modern credit card with dimensions that allowed them to fit in a wallet. In rare instances, passes were made of some other material. 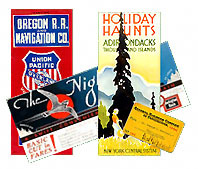 Postcard-collecting is, of course, a major hobby in its own right; however, the railroad postcard has become a sub-category of railroadiana collecting. All kinds of railroad postcards have been issued, ranging from pictures of stations and scenery to pictures of railroad equipment and even wrecks! 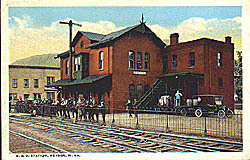 The type of postcards available include "real-photo" postcards, "linen finish" postcards, and the more modern "chrome" postcards. Since postcards tend to be inexpensive, they are a great way to begin collecting. The items described above represent only a fraction of the railroad memorabilia that collectors search for. Almost everything that was used in railroad operations (especially if it carries a railroad marking) is of interest to somebody. Copyright 2001 � The Railroadiana Collectors Association, Incorporated. All rights Reserved.